The Ochre-bellied Hawk Owl is a small to medium-sized owl with no ear-tufts and a relatively long tail. 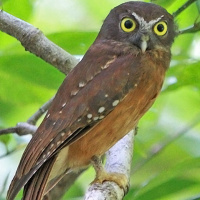 It is also known as the Ochre-bellied Boobook. Typical calls - Dumogo Bone, Sulawesi. © Dave Farrow. Description: The facial disc is brown, becoming paler towards the yellow eyes. Narrow whitish eyebrows are present. The cere and bill are yellowish-horn, and the chin is whitish. The throat is prominently white, especially so when calling. Upperparts are dark chestnut, tinged with brown, duskier on the crown. The outer webs of the scapulars have whitish spots, and the wing-coverts have some white dots. The Primaries and secondaries have whitish spots in the outer webs, but the inner webs of the primaries are unmarked. The tail is relatively long and darker brown, barred with narrow, whitish-buff bars. The central tail feathers are sometimes unbarred. Underparts are tawny, with some indistinct paler barring on the upper breast. From the lower breast towards the belly shades gradually into ochre-tawny with some diffuse darker dots. Tarsi are feathered to the base of the bristled toes, which are yellowish-grey with dark horn claws. Size: Length 25-29cm. Wing length 180-196mm. Tail length 92-105mm. No weight data available. Females are usually smaller than males. Habits: An elusive and little-known bird. It roosts during the day in dense vegetation, singly or in pairs. Voice: A series of hoarse, guttural notes which develop into a series of double-note calls - Krurr-krurr. Hunting & Food: This owl feeds mainly on insects hunted from perches in the mid-storey of the lower tree canopy. 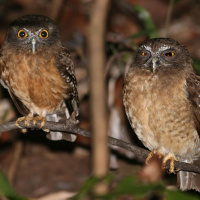 Breeding: The breeding habits of the Ochre-bellied Hawk Owl are unknown. Habitat: Mainly mature secondary and riverine forests. Ranges from lowlands up to about 1000m above sea-level. 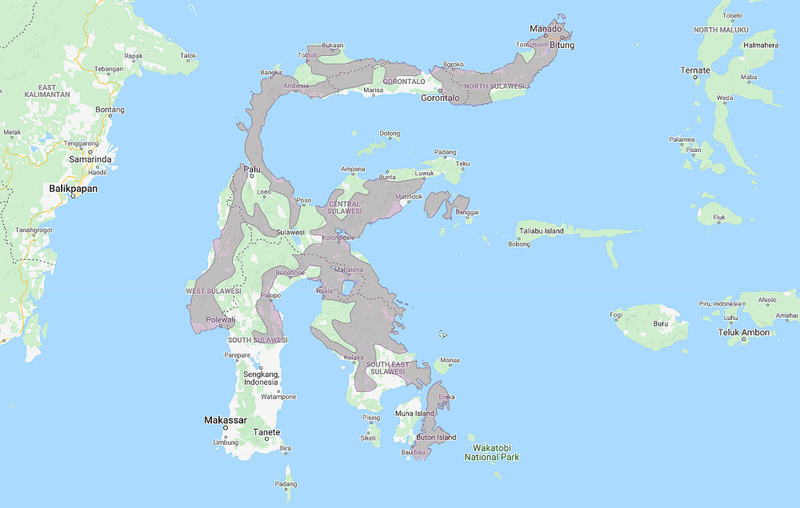 Distribution: Sulawesi, Buton and Peleng Islands in Indonesia. Status: Rather rare, probably threatened. Original Description: Schlegel, Hermann. 1866. Nederlandsch Tijdschrift voor de Dierkunde [Dutch journal/magazine for Zoology], 3, p. 183. Page by Deane Lewis. Last updated 2016-06-05.